-- company or quit as ABC news digital special reports Ben Bernanke up they're celebrating the 100 year anniversary of the Fed. And with him fat past -- shares Alan Greenspan Paul Volcker and you can see just an upcoming changing of the guard Janet -- sitting beside as well. Wall Street watching that meeting today to see if the current chair Bernanke will give any hints of tapering. Today though likely to be more ceremony than substance the big day is this Wednesday but still a significant day today. And so joining me -- to discuss some of the points about today and also -- the coming days. Joseph -- economics analysts for the street Joseph thanks for being with us -- we appreciate it. We're gonna go back and forth between between. As vernacular making his way up to make some -- just a minute but first and is -- how to go over catcher went up right now. Bernanke at a seven year run leading the Central Bank he's not have the option of beginning the end essentially of that unconventional asset purchase program popularly called. Quantitative easing. And now the Federal Open Market Committee will be holding its two day meeting on Wednesday Joseph -- -- get -- minute but first current fed chair Ben Bernanke. Well. Paul and Alan had me at a disadvantage we were each asked reflect on our term in office. But they have little bit more perspective and I do at this point have -- few few more weeks ago. And a number of tasks that we undertook such as achieving a full recovery. In the US economy are still ongoing. There will offer -- thoughts about the last eight years. The Federal Reserve's extraordinary response to the financial crisis and the Great Recession. Was in some ways nothing new. We did with central banks -- done for many years and what they were created to do. We served as a source of liquidity and stability in financial markets. And in the broader economy. And we work to Foster economic recovery and price stability. However in another sense what we did was very new. He was unprecedented in both scale and scope and -- use of a number of tools that were new or at least not part of the conventional Central Bank toolkit. We found that these new tools were necessary if we were to fulfill the classic functions of -- Central Bank. In the context of -- 21 century economic and financial environment. When financial system teetered near collapse in 2008 -- 2009. We responded -- nineteenth century essayist water -- had advised. -- serving -- -- -- provider of last resort to financial firms and markets. We did so in institutional environment that was very different and in many ways much more complex than the -- invention. For example the recent crisis -- runs and financial institutions as occurred in classic -- But in 2008 rather than -- the retail bank depositors. The run occurred in various forms. A short term uninsured wholesale funding. Such as commercial paper and repurchase agreements. Moreover although -- -- commercial banks suffered large losses and some came under significant pressure. The crisis hit particularly hard those non bank institutions most dependent on wholesale funding such as investment banks and securitization vehicles. Thus the -- that not only to commercial banks but also extended its liquidity facilities to critical non bank institutions. And -- financial institutions and markets. Like commercial paper market. To minimize the risk of strange abroad feeding back to US dollar funding markets the Fed also coordinated with foreign central banks. To create a network of currency swap lines. Beyond the provision of liquidity to fed work and other agencies both here and abroad. To help restore public confidence in the financial system. Notably we led the development of stress testing of large -- organization's capital adequacy. The first stress tests 2009. And the public disclosure of the results made it possible for large US banks to once again attract private capital. Since 2009 to stress test and disclosures. Together with other regulatory and supervisory actions. Have contributed to a doubling in capital held by the largest US financial institutions. And the resumption of more normal flows of credit. The Fed is also worked to draw upon the lessons of the crisis -- to take the steps necessary. To avoid a similar events in the future. As those assembled here well know. The deliberations that led to the founding the Federal Reserve were precipitated by -- financial panic panic of 1907. The preservation of financial stability was consequently. A principal goal of the creators -- the new Central Bank. In response to the panic of 2008. The Federal Reserve has returned to its roots -- restoring financial stability. As the central objective. Alongside the traditional goals of monetary policy. We refocused our supervision of financial institutions. To take a more macro prudential approach that Foster systemic stability as well as the stability individual institutions. We also more extensively monitor the financial system as a whole. And cooperation with other agencies. Have put in place stronger oversight -- systemically important financial firms. Including higher capital and liquidity -- requirements. Tougher supervision. And processes for early resolution. We've also had to be innovative in finding ways to use monetary policy to help the economy recover from the deep recession to follow the crisis. Providing adequate monetary accommodation has not -- a straightforward task because our principal monetary policy tool to target for the federal funds rate. Has been stuck near zero since the end of 2008. Consequently we've had to find other ways to bring monetary policy to bear. Notably including techniques designed to influence longer term interest rates. For instance the -- like several other central banks -- purchase longer term securities to put downward pressure. A longer term interest rates help ease financial conditions and promote -- stronger recovery. A significant aspect of finding innovative ways to -- do our duties as a Central Bank in new more complex environment. Has been the ongoing revolution in communication and transparency. Part of that effort has involved formerly defining our goals under the mandate for maximum employment and price stability given to us by the congress. Two years ago we established 2% as our inflation goal. And we regularly communicate -- as -- policy makers' views of the level of unemployment expected to correspond. To maximum sustainable employment over time. Additionally and our monetary. Policy has come to rely more heavily on forward guidance. With our short term policy rate about as low as -- condone. We have sought to ease financial conditions further and provide additional impetus. By communicating both quantitative -- -- the likely future path of policy. And qualitatively about to -- the evolution of our balance sheet. -- other central banks around the world have met the challenge of current conditions with similar innovations. And I would be remiss if I did not point now especially -- Paul and -- here. To the Fed's recent communications innovations owe a great deal to developments like the monetary targeting framework devised and chairman -- And the post FOMC statement and qualitative for guidance introduced -- -- chairman Greenspan. In summary the financial crisis that the -- confront in five years ago. It was in many ways analogous to panics a central banks have faced for centuries. But the same time -- crisis and a deep recession that followed. Occurred in an economic and financial environment. That was certainly different and in many ways more complex than in the past. The Fed reserve found ways to carry out its traditional Central Bank functions in that environment. And we are working with other policy makers domestically and internationally. To put in place to strengthen regulatory framework there will help preserve stability. In the face of the complexity. Inner connectedness. And innovation of -- modern financial system. One of my personal objective since I became chairman has been to increase the transparency of the -- To more clearly explain how our policies are intended to work and the thinking behind her decisions. This -- noted improved communication can help our policies work better. Whether through the disclosure of bank stress test results. By helping the public and the market better understand how monetary policy is likely to -- Ultimately however the most important reason for transparency and clear communication. Is to help ensure the accountability -- -- independent institution. To the American people and their elected representatives. Clarity transparency and accountability. Help build public confidence in the Federal Reserve. Which is essential it is to be successful. In fostering stability and prosperity thanks for inviting me to this wonderful event thank you. Joseph go if the street from market stuff 150 points when we read into that could bring it to say anything to indicate what he might be go to the following weeks. Now however right now -- the federal -- the Federal Reserve bankers on the FOMC including -- name here and a blackout period and so right now they're not giving any sort of economic information. To the market until Wednesday but we got to hear from Ben Bernanke. Today and from the other chairman was basically what they've been doing. Since Volcker came and in the 1970s and what they've handled in some of the innovations they brought to the Central Bank which now you know is turning hundred years old this year. And so after wait now for Janet Yellen incoming expected in coming fed chair. As were waiting for her to take it to the -- -- ask you about this Wall Street Journal report poll found that. About a quarter of the economists that were pulled they expect to taper announcement on Wednesday that has been. Somewhat hired -- -- confidence level that there's going to be significant announcement it. Absolutely a number of the different analysts and economists I've been talking to over the past couple weeks. Have grown in number who think that we might actually get a taper announcement in December and that's because of the load of good economic news have been seeing a manufacturing activity laid the labor data and housing information has been pretty solid. And so this gives a number of economists reason to believe that the Fed might try out. -- something in terms of pulling back on quantitative easing likely in the longer term treasuries. But I AM still hearing probably more people. More economists more people -- the never saying we're looking at that march. That march announcement to be when we really see a pullback by the Fed but I would not be surprise at this point if we do hear something on Wednesday let's take a walk through it. History if -- -- because as we saw as that -- -- marking a hundred years. For the Federal Reserve. Three powerful leaders of the -- all gathered together today Alan Greenspan Paul Volcker Ben Bernanke. How was the Fed policy impact -- the economy over the years as far as if you look at 2008 and then going further back back to the years Paul Volcker when he was. For two point -- card. We'll starting in 2000 -- the burden the Bernanke period -- it's it's hard to say that. The -- that the Fed has not affected the economy in every way I mean a lot of arguments against. Federal Reserve's quantitative easing is that the markets have fundamentally moved up and down based on the latest forecast the latest information coming out from Ben Bernanke and other central bankers -- mean. Every time the Fed president of a different Federal Reserve Bank comes and speaks often times -- news the market. When -- -- back to Volcker mean Volcker came in at a time of high inflation he came in and mealy says we we really have to bring this inflation down. Initial news -- -- were not that successful but eventually they are able to rein in the inflation problems. Which brought in of course following them Alan Greenspan. Alan Greenspan. A great time of economic growth here in the United States America. Though his critics do point out that he kept rates probably too low throughout his time. Considering that there was so much growth in this economy and markets have had an incredible run this past year up more than 20% in fact -- today. And we're taking a look at how the Dow is -- -- there up about a 150 points just short at 15100904. Skeptics though Harte saying that because the Fed has been. Pumping money into the economy 85 billion a month there that is essentially it's a sugar high that it's and it's and it's an artificial. It's it's -- -- economy. Right well critics have been pointing that out there has been a lot of discussion in recent weeks and maybe even months that. You know hey is there a stock market bubble when you look to. To the price earnings ratio on the S&P. About a healthy levels about fifteen right now -- looking -- just about seventeen. Which a number of analysts unit chief investment officer as saying that that really doesn't suggest a bubble economy but. Yeah we certainly have seen stocks rise quite a naming 25% this year in the S&P and a large argument for is that with the Fed. Give you know using their monetary stimulus program. It -- stocks a little bit of cushion there. But a lot of people -- talking to are expecting taper next year and 2014 are saying when we do get to taper right not if but when we get to taper next here. We're gonna CDS and people back into kind of a recession we might get a 34%. Drop. 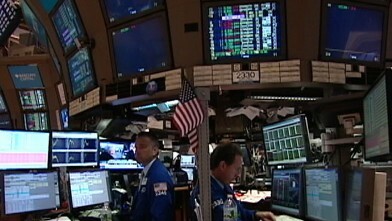 But that's only to be expected and they're not too worried about a drop like that especially seeing stocks rise that. The way that they had this year play that out then what's gonna happen if someone's 401K. Retirement plans. I I think in general when you're talking to investment managers who are dealing more with retirement they're saying that and this is not that. -- the worst time was probably in 20082009. Really when the whole economy was losing money we're losing jobs. Now you can look and see that there is a bit of stability in the economy and what does that -- well it means for seeing more hiring. We are seeing that unemployment rate dip in the most recent report said we're not releasing -- an inquiry dip overseeing participation rate go higher. Which means that more of those part time workers are coming on to full time. It suggests that some people with the regular 401K. Maybe there isn't so much worry about right now maybe not the way that they were warring in 20082009. During the height of the recession does this mean -- suddenly back in 199596. In terms of economic growth not certainly not. But most of the economists and analysts -- talking to -- pretty confident right now on -- not overly confident doesn't seem like a market -- -- on the front of itself. Let me ask you this thing going forward and as far as like any kind of a policy change but from Ben Bernanke to incoming expected chair Janet Yellen. She's been widely seen as someone -- take the -- in a in a more progressive. Direction. What are we -- -- as far as the agenda -- variation that she might have for Bernanke. So I think a little bit of the worry initially been that Janet Yellen would be far more dovish another -- issue be more open to monetary stimulus more economic stimulus. Then Ben Bernanke -- what it seems at this point is that yellen is well known for her communicate. Communication skills it is also pretty good it. Speaks -- in layman's terms monetary policy. I'm so I think what a lot of people are expecting is that -- is gonna come and she's gonna have to be the person that really -- begins this large scaling back. Of asset purchases by the Federal Reserve she will be the person who brings the Federal Reserve out of this unprecedented period. Comments so what you we'd expect for her she won't be established as people are arguing I don't think I mean. Inherently -- pulling back on quantitative easing that's not a very Donna Smith she's gonna wanna keep an eye on inflation of course you know a lot of people are saying. We're not seeing inflation now but it could be a longer term issue and then I think she's really gonna continue to focus on that unemployment. Projection by the Federal Reserve they've been talking six point 5% unemployment at a point at which they we consider raising federal funds rate raising interest rates. It's really going to be interesting time -- -- period is going to be totally different from the Bernanke period the way the Bernanke was totally different from Greenspan and further back. And so we shall wait to see how that will play out in the coming weeks the beginning of 2014. Joseph -- from the street Joseph thank you for your time your insight analysis. Invaluable thank you so much. And of course that news conference that ceremony will continue live streaming right here on abcnews.com and we have a complete reports well. And on down -- New York with this ABC news digital special report. If approved, Federal Reserve nominee Janet Yellen would be the first woman to hold post. 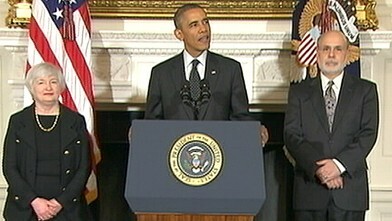 Ben Bernanke announced the Federal Reserve will not ease off the economic stimulus program. 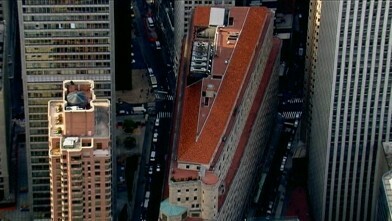 Government sting operation nabbed suspect who allegedly attempted to blow up the NYC building.